(RT) Germany owes Greece no less than €278.7 billion in World War II reparations, Athens said, referring to the destruction wrought upon the nation during the Nazi occupation. The sum exceeds Greece’s total debt of €240 billion to the EU. “According to our calculations, the debt linked to German reparations is €278.7 billion euros, including €10.3 billion for the so-called forced loan. All the other amounts are related to allowances for individuals or infrastructure,” said the country’s deputy finance minister, Dimitris Mardas. The figure was calculated by a parliamentary committee and the Greek supreme court. The numbers have previously varied between €269 billion and €332 billion. Mardas added that at the 1946 Paris Conference the amount of reparations was set at $341.2 billion. Many Greeks blame Germany, as the country's biggest creditor, for the tough austerity measures and record high unemployment it faced after getting two international bailouts total worth 240 billion euros. The Greece's statement comes ahead of left-wing Greek PM Alexis Tsipras’s visit to Moscow and meeting with President Vladimir Putin on Wednesday. The newly elected PM is planning to boost cooperation and strengthen ties with Greece’s eastern neighbor. Greek lawmakers voted Tuesday to favour of establishing a special committee to examine the circumstances which led the country to enormous bailouts from troika of international creditors - the European Central Bank (ECB), the International Monetary Fund (IMF) and the European Commission (EC). "After five years of parliamentary silence on the major issues that caused the bailout catastrophe, today we commence a procedure that will give answers to the questions concerning the Greek people," Tsipras said. 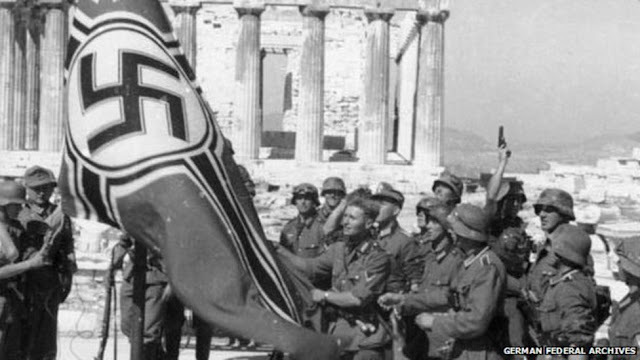 The issue of war reparations dating from the 1941-44 Nazi occupation of Greece is likely to increase already heightened tensions between Athens and Berlin. The two countries are already squabbling over Greek demands to renegotiate the terms of a €240 billion ($260 billion) Troika bailout. During WW2, more than 800.000 Greeks died. The movement in Greece to get Berlin to pay up has become stronger over the last few years as Athens experiences financial hardships following austerity measures, which were a prerequisite of being given the bailout money, to stop the country from falling into financial ruin. The left-wing Syriza government has decided to raise the issue of war reparations again with Berlin. "Germany has never properly paid reparations for the damage done to Greece by the Nazi occupation,"Prime Minister Tsipras, the leader of the anti-austerity Syriza party, said in March. "The crimes carried out by the Nazis are still vivid, and we have a moral obligation to remember what the forces did to the country." Berlin has flatly denied it owes Athens any more money, saying it already paid Greece war damages of $25 million in the 1950s, equivalent to $220 million today, and also paid out 115 million Deutschmarks (a sum worth around $230 million today), to victims of Nazi crimes in the early 1960s. A 2012 report by the Bundestag, Germany’s lower house of parliament, estimated the value of the loan at $8.25 billion (€7.57 billion). Greece, however, puts the value of the loan at €11 billion, the To Vima newspaper reported in January, citing confidential financial documents. Greece says it always considered that money as only an initial payment and expected the rest of the money to be paid back following German reunification. After Nazi forces took control of Greece in 1941, the stage was set for one of the bloodiest confrontations of World War II as Greek resistance fighters put up a fierce struggle to end the occupation. They were powerless, however, to prevent the Third Reich from extracting an interest-free 476 million Reichsmarks loan from the Greek central bank, which devastated the Greek economy.